Micro-RNAs (miRNAs) – What are They? Why are They Hot Doping Candidates for the 2020s? How do They Work? Micro-RNAs aka miRNAs are small non-coding RNAs that regulate gene expression at the post-transcriptional level… What? I suppose you have heard of epigenetics? Well, miRNA molecules also play a role in epigenetics by triggering “post-transcriptional” changes, i.e. in between the transcription and the translation of a gene. It is thus not surprising that there is growing evidence that they are involved in a plethora of biological processes – biological processes in the course of which they occur naturally, processes like exercise, for example. More recently, scientists have found out more and more about the way miRNAs play a decisive role in the adaptations that occur in the hours and days after you train. They are involved in protein synthesis, mitochondrial biogenesis, muscle repair and all the other processes you want to accelerate or improve n matter if your are doing resistance, endurance or any other exercise. In view of the increasing evidence that miRNAs trigger, block or facilitate many of the various beneficial responses to exercise and promote the regenerative processes that start at the very moment you rack the weights, it can hardly be surprising that that miRNA modulating supplements or drugs are on the top list of “drugs-to-develop” of many researchers. 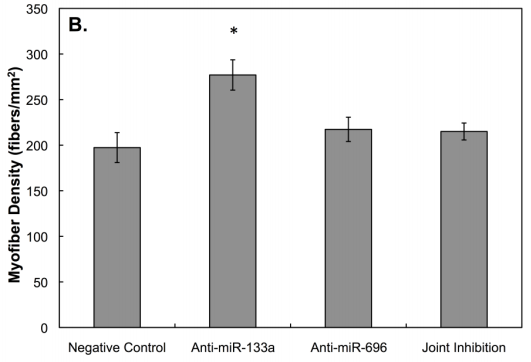 As of now, however, the focus is on the usual suspects (see Figure 1) like battling Hepatitis C with MiR-122, preventing or reversing cardiac remodeling with MiR-208, soothing inflammation with MiR-155, controlling or even reversing MiR-21, clearing or preventing atherosclerosis with MiR-92a, battling metabolic disease with MiR-33 or MiR-103/107, treating myeloproliferative diseases (non-leukemia proliferation of blood cells) with MiR-45 and triggering cardiac regeneration and repairing injury with MiR-15. miRNA-related patent distribution in the United States (1661 in total | van Rooij. 2016). Although the miRNA-related patent documents spanned over 60 IPC code categories, almost half of them were not miRNA drugs, but rather patents of technolgies that allow for their successful delivery. 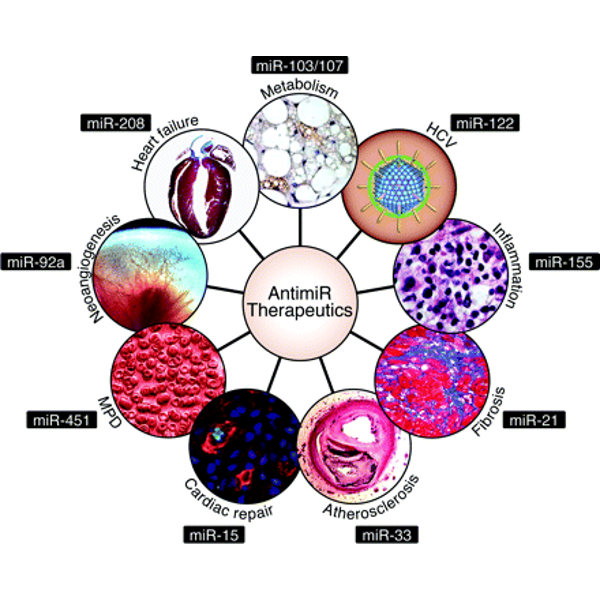 How far are we with developing miRNA-drugs? The development of drugs, which are designed to either act as analogs or block the function of miRNA, has progressed significantly over the past years. The overview of the various patents that had been filed in the US for years ago, already, indicates that (van Rooij. 2016 | Figure on the left). The majorit of filings are yet agents / methods needed to deliver or produce corresponding agents. 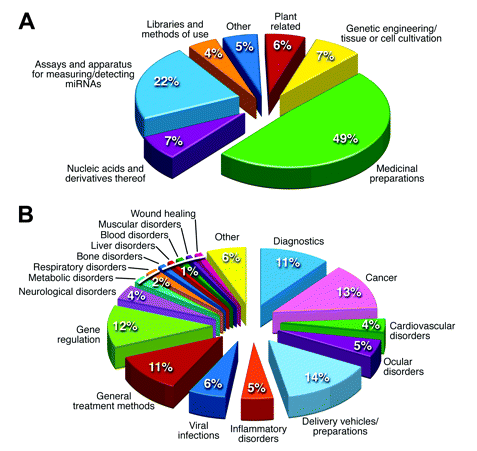 “Only” 12% of the patents include actual miRNA regulating drugs. Among these you will find straight miRNA molecules, as well as compounds targeting miRNAs, and methods of regulating RNA interference. Likewise on the list are patent filings directed to multiple therapeutic uses of specific miRNA molecules comprised the majority of the general treatment methods group. They account for 11% of the patent documents categorized in the Figure on the lest. Applications and patents disclosing diagnostic uses for miRNAs represented a fourth larger category on the list of the US patent office. In view of the plethora of potential applications, it should be obvious that it would go way beyond the scope of this article to address all potential drug targets. Accordingly, I am going to focus on the state of the art in exercise related miRNA related research – research that has as of now, not yet produced an FDA-approved performance booster, but could certainly be the future of legal and illegal performance enhancers. Table 1: MicroRNAs and acute exercise. Resistance Exercise (RE); Endurance Exercise (EE); Human (H); Mouse (M); Rat (R); 1 Repetition maximum (1RM); Maximal oxygen uptake (VO2max); Maximal power output (Pmax); Individual anaerobic threshold (IAT); No Change (NC | Meurer. 2016). Recently, Meurer et al. have published the above overview (Table 1) of pertinent research in the German medicinal journal “Deutsche Zeitschrift für Sportsmedicine” (Meurer. 2016). The tabular overview reflects what I hinted at previously: Simply supplementing with certain miRNAs will not cut it. Figure 2: In a 2011 study, scientists observed that differences in the miRNA response to a std. resistance training protocol explained the differential effects on leg muscle mass (Davidsen. 2011). Why? Well, let’s take the example of Davidson’s 2011 study in elderly humans (#1 on the list): In said study, the subjects who reacted with the least significant muscle gains to a standardized resistance training had significantly higher miRNA-451 and lower miRNA-378 levels. Any doping agent that would counter this disadvantage would thus have to have the ability boost miRNA-251 and block or lower miRNA-379 – of these, only the former could be done by supplementing straight miRNA-451 in a bioavailable form; to reduce the levels or block the effects of miRNA-378, however, it would take a different agent, one that blocks the effects or production of miRNA-378. If scientists found an agent or a drug combination that could do both, however, it could more than quadruple the muscle gains in a certain part of the population (whether it would also double the gains of young(er) individuals would have to be seen, but it’s unlikely it would be completely useless). Other studies, suggest that circulating miRNA, such as miRNA-486, which appears to be involved in the improvements in insulin sensitivity in response to exercise (Aoi. 2013), have similar important roles in the regulatory mechanisms that are induced by exercise. The mechanisms that are illustrated in Figure 3, are putative and based on the theory that miRNAs, much like cell-based hormones, facilitate a direct cell-to-cell communication and are therefore being secreted into the circulation, where they target neighboring cells to exert a paracrine functions (Chen. 2012). Figure 3: MicroRNAs are secreted into circulation via multiple carriers, including exosomes, microvesicles and apoptotic bodies or bound to proteins like HDL (high density lipoprotein) and RNA-binding proteins (RBP). This provides protection from RNases and thus degradation when delivered into circulation. C-miRNAs are thought to be released or leaked into circulation in response to stress, injury or tissue damage. Though, the exact release mechanisms (active/passive) as well as uptake of microRNAs into multivesicular bodies (MVB) are still in need for clarification (Meurer. 2016). 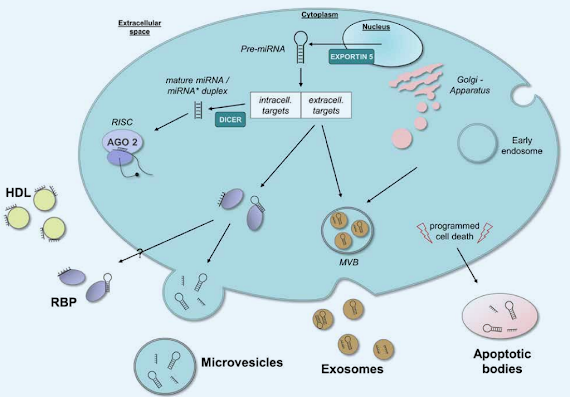 As you can see in Figure 3, miRNAs are either incorporated into vesicular structures like exosomes, microvesicles and apoptotic bodies or bound to proteins like HDL and RNA-binding proteins that are carrying around in your blood and give them the ability to exert hormone-like actions. Unfortunately, the “packaging” and transportation of miRNAs is yet another of several not yet fully understood aspects of the ways in which miRNAs work their muscle building, fat burning and disease curing magic – aspects that will have to be elucidated before the age miRNA drugs and doping can begin. By the means of anti-miRNA treatments scientists are already able to control the myofiber density of artificial human skeletal muscle; by other switches enhance their contractile properties and more (Cheng. 2016). We are not yet there, but… Even though respective drugs are still in the development pipeline of laboratories all across the world, the way they will (one day) be able to alleviate the hypertrophy break, help remodel skeletal muscle, improve regeneration or boost mitochondrial biogenesis leaves no doubt that functional miRNA drugs could be the most popular doping agents of the 2020s. In engineered human muscles, for example, Cheng et al. (2016) have already demonstrated that the inhibition of microRNA-133a will enhance the differentiation of muscle cells and thus increase muscle density in the petri-dish. And let’s be honest: This result is too promising to believe that corresponding drugs are being developed and maybe even tested in human guinea pigs at the very moment that I write this article | Comment! Aoi, Wataru, et al. “Muscle-enriched microRNA miR-486 decreases in circulation in response to exercise in young men.” Front Physiol 4 (2013): 80. Chen, Xi, et al. “Secreted microRNAs: a new form of intercellular communication.” Trends in cell biology 22.3 (2012): 125-132. Cheng, Cindy Sue, et al. “Cell density and joint microRNA-133a and microRNA-696 inhibition enhance differentiation and contractile function of engineered human skeletal muscle tissues.” Tissue Engineering ja (2016). Davidsen, Peter K., et al. “High responders to resistance exercise training demonstrate differential regulation of skeletal muscle microRNA expression.” Journal of Applied Physiology 110.2 (2011): 309-317. Meurer, S., K. Krüger, and F. C. Mooren. “MicroRNAs and Exercise.” Dtsch Z Sportmed 67 (2016): 27-34.
van Rooij, Eva, Angela L. Purcell, and Arthur A. Levin. 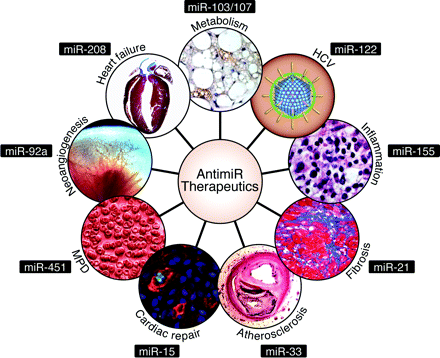 “Developing microRNA therapeutics.” Circulation research 110.3 (2012): 496-507.